I'm sure to most people, asking someone for a kidney seems absurd. In all honesty it does seem a little crazy, even by today's standards. However, this is what people diagnosed with kidney disease and those who are living with kidney failure on dialysis must seriously think about and do if they want to live a 'normal' life. When someone is diagnosed with kidney disease, complete failure of the organ is inevitable. It might take longer for some than others, but when you are at significantly decreased function, dialysis and transplant are the only treatment options. Yes I said treatment. Neither is a cure from kidney failure unfortunately. Transplanted kidneys last in general from 10-15 years, sometimes less, sometimes longer. It's important to note though, the first successful kidney transplant was performed in 1954 and the procedure has become much more routine and highly advanced since. Transplant surgeries have become very common and successful in hospitals. In fact there was a record number of kidney transplants performed in the United States from 2015 to 2016, going from 17,878 to 19,061. Dialysis is life support. Which is something I really want you to think about, especially if you are not a kidney patient. Just image living that reality day in and day out that you literally depend on a machine for life. Now you might think that very thought would be a HUGE motivator to go forward and ask someone to donate a kidney to you. 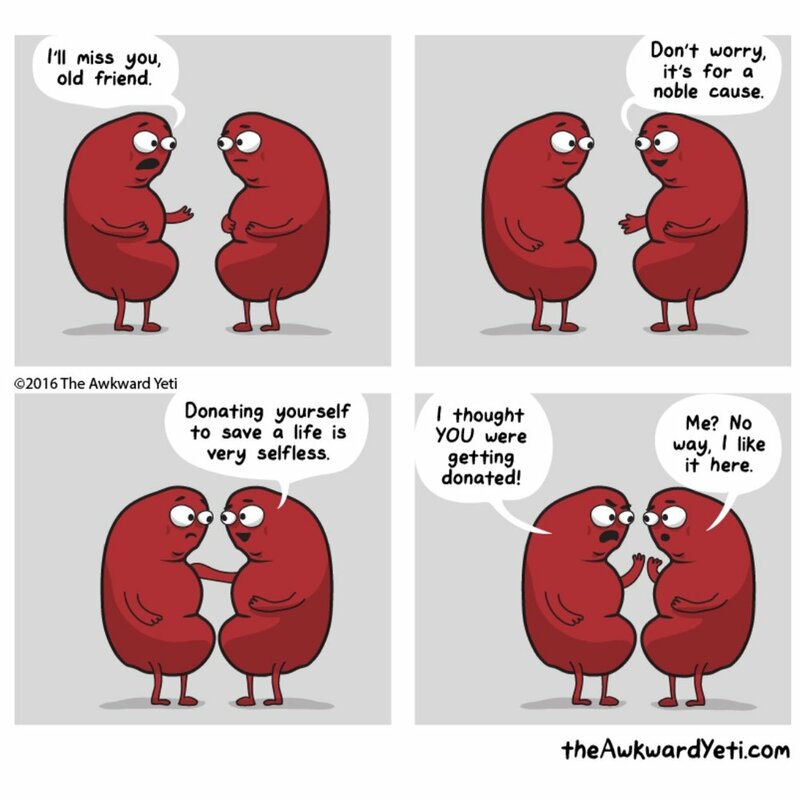 However, kidneys are not something people are readily handing out to others like it's no big deal. You are literally asking someone to go through a major surgery and give a piece of them to you. In my own experience, it's not an easy conversation to have with family, friends or coworkers. You might feel super awkward, like a burden or even a Debbie Downer bringing the topic up. And really everyone will react differently. Luckily in this digital age, you have many options for getting your story out there. You have Facebook, Instagram, Twitter, YouTube, blogs, personal websites etc. People are connected more than ever before because of technology and social media. Use that to your advantage. If it is a topic you have a hard time bringing up, use social media as your soapbox. In my experience though, in order to be successful, you must make finding a living kidney donor your job in a sense. People's attention span is incredibly short these days and most people don't have kidneys on their mind all day like you. Therefore you must make an impact with your story and do so consistently. You need to make a connection with someone - which is why it is so important to really TELL YOUR STORY and what a new kidney would do for you, your loved ones, your career, your passions etc. I can't tell you how many people say they want to help and they will contact those in need and then that's it. No follow through. Show everyone that THIS IS YOUR LIFE on the line. Make shirts, paint car window signs, post flyers if you have a hard time actually verbalizing your need. Get creative, make it personal and GET LOUD. Don't be afraid to be vulnerable and don't waist a single minute. Create awareness about your need. "will you donate a kidney do me?"